If you are a millennial man, chances are that you learned how to shave using a disposable razor. Nothing wrong with that. It is a very popular method of shaving all due to the convenience and ease-of-use it offers. Then there are the electric shavers that offer an even quicker and easier method of getting the job done right. That’s all well and good, but there is something about an old-fashioned wet shave that still rules the hearts of real men across the world. The trouble is that most young men have never even heard of this technique. It’s an old but satisfying method of shaving, and it’s got a bit of a learning curve. KC Shave – Bringing The Satisfaction Back to Shaving! This is where KC Shave comes in. 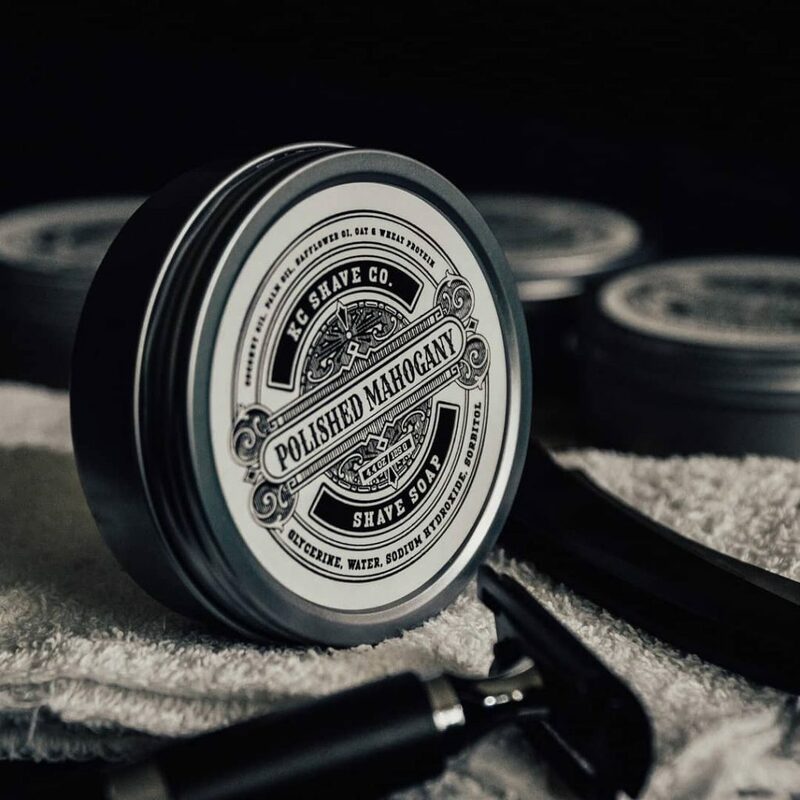 This brand is dedicated to popularizing the ancient art of the wet shave. Their premium shaving kits, shave oils, colognes and more, are perfect for men who want a little something extra from their grooming routine. Gone are the days of cheap, breakable, disposable, throwaway razors. Also say goodbye to high-end, super-expensive shaving kits that never last as long as they are supposed to. Wet shaving is making a major comeback, and once you hop onto this trend, you’ll never go back to sloppy modern methods because the difference is clear as daylight… it’s just like getting a bespoke suit tailored to fit you, instead of just buying one of the racks. There is just something about a languorously luxurious wet shave. It’s more than just a tradition… it’s a revelation. It’s for men who take pride in their grooming and like looking after themselves. When they want shaving to be a relaxing, fulfilling experience, they go for a wet shave. There’s a certain satisfaction that comes with spending time and effort into a proper, old-school shave. And KC Shave is there to make it even better with their world-class products. Seldom have we ever come across a scent that is truly manly. KC Shave has managed to achieve it with a strong woody scent, that won’t leave you smelling like the entire forest, but something a lot more exquisite, magical yet manly. The Polished Mahogany Shave Soap is sold in a 4.4 oz. round tin. You won’t even need to move the soap to a bowl to lather it up, there is enough space left within the tin for you to do that. But if you really want to test out its lathering capabilities, get a large bowl anyways. KC Shave also sells a superb Omega board bristle brush. Take one and soak it for 10 to 15 minutes, to really open up the bristles so they can work their wet magic for a superior wet shave. Now whirl that brush on the shave soap and watch as it goes from pre-lather to full-fledged shave-ready lather in 2 to 3 minutes. The reviews boast of how creamy and smooth this lather is. And why wouldn’t it be? It contains coconut oil and glycerin that help deliver a smoother & closer shave, moisturizes freshly shaved and often irritated skin, and even help clear up blackheads in the course of a tweet. And did we mention it smells amazing? This product also makes a remarkable gift for the wet shave aficionados in your life. 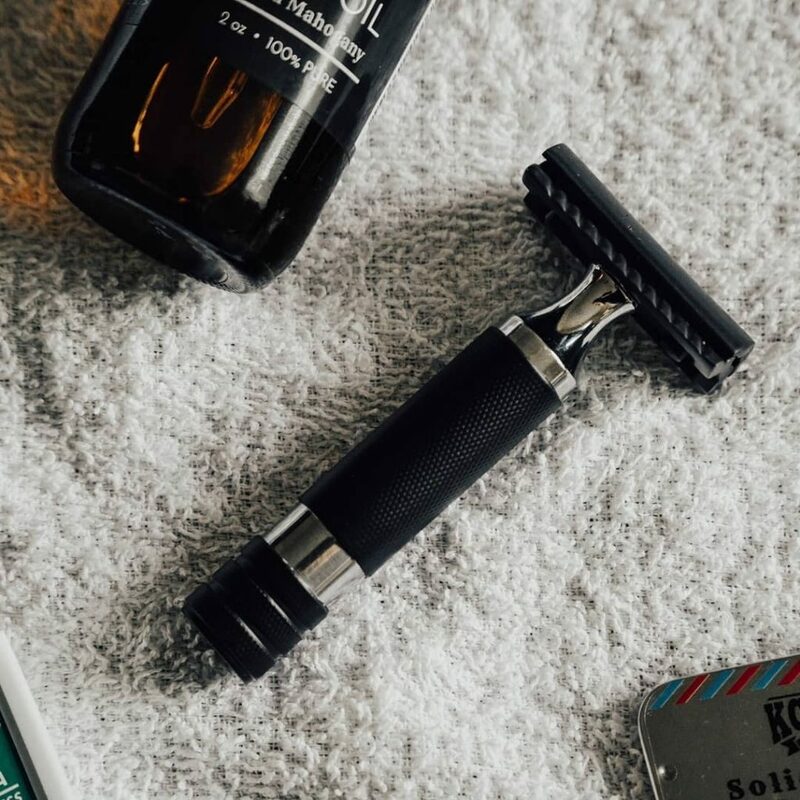 If you are still a little worried about what wet shaving entails and what products you’ll need altogether, KC Shave is determined to make your life easier. They do several shaving kits that include all the necessary products for a great wet shave at home… smooth, luxurious, slow and very, very manly. YES!!! Our favorite mahogany soap is already included, so is the premium badger shaving brush. You’ll also get an open safety razor in the curated box. And last but not the least, you’ll get spare blades that come standard with the kit. All in all, this box has everything you need for a great shave. The curvy black resin safety razor has a nice heavy-weighted handle and a closed design that ensure safety as you enjoy a lazy wet shave. The premium badger brush is made from real badger hair, so you get to take advantage of the ridiculously soft coat for a beautiful lather. This brush will not disappoint and will last you ages. And we’ve already waxed poetic about the polished mahogany shaving soap, and it’s deep rich woody fragrance. 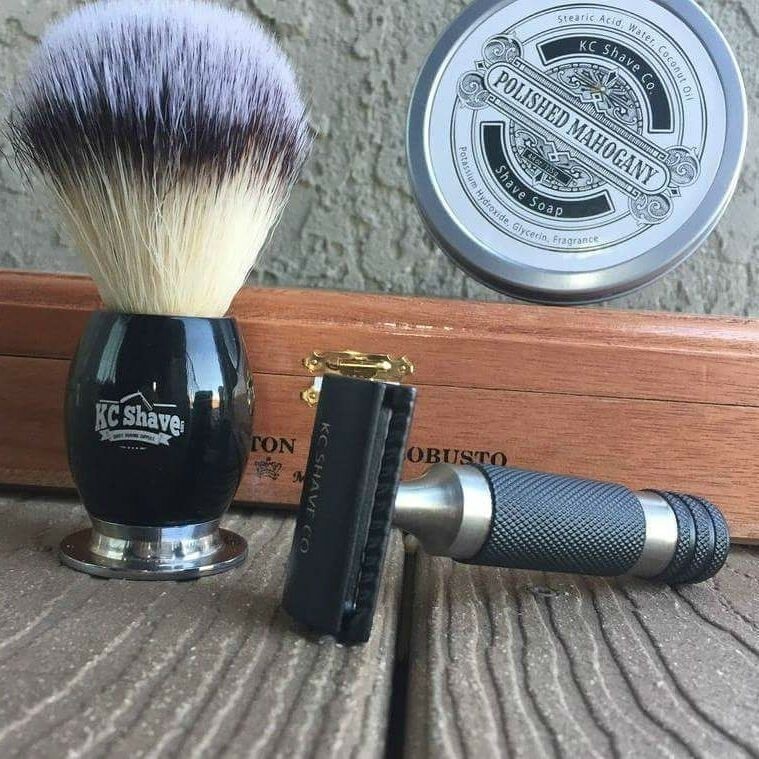 This kit is a great way to start your wet shaving obsession. The Last Word: Ready to Brush Up For the Ultimate Shave? 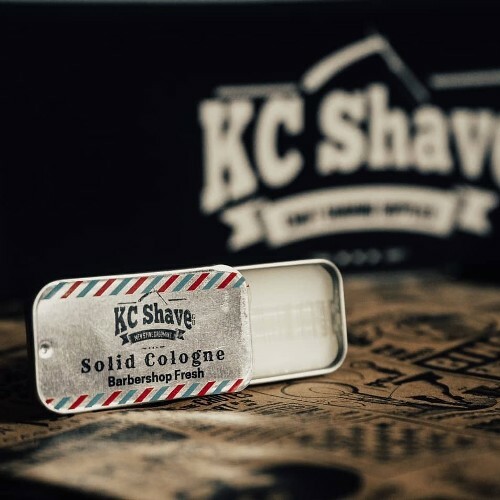 KC Shave may be a new brand, but their product offering is built on longstanding tradition and the comfort of a familiar ritual…. The one of wet shaving. Once you get hooked, it’ll be a no-brainer to ditch the spray and use shaving cream. 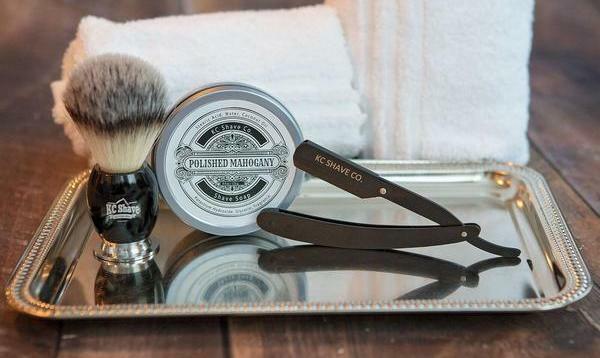 Some warm water and shave soap, a trusty shave brush, and your favorite shave mug. This is how guys used to do it in the old days when a close, clean shave was more than just an obligation, it was a matter of pride in personal style and hygiene. Other amazing products you can find under the banner include the Exclusively Formulated Mahogany Pre-Shave Oil that retails for $18 and is worth every penny – thanks to its lubrication capabilities that keep the skin moisturized and smooth, and the Men’s Solid Cologne, which retails for $12.95 and is everything you need to look and smell fresh, clean, and like a classic gentleman. Men have been keeping themselves groomed and looking good for many centuries, since well before these five-blade cartridge razors were invented. KC Shave just offers a great way to look just as dapper as your grandpa did. These old-fashioned grooming products have stood the test of time and have been favored by true gentlemen across millennia. Your grooming can now just be as legendary as theirs… pick your favorite KC Shave Co. products today!